This wild Scottish landscape is viewed from high up on the mountainside. We look across the tops of other mountains to the clouds and sky beyond. We are on the same level looking across and down into a deep gorge cutting in the rocks, where a stream travelling down the mountain topples onto the river bed below. We also look down upon two small figures, men dressed in Highland kilts with two dogs. They appear to be talking at the side of the pathway, which winds towards the centre of the composition, as if to where, we, the viewers are standing. They could be two Scottish ghillies out with their hunting dogs, searching for deer or game. Across the river on the opposite mountainside we can make out three men, one in Highland dress carrying a long shotgun, and another two in country-style clothing also carrying guns. We can surmise that this is a hunting party, possibly with the landowner, out for a day’s shoot. Set against the shadows amongst this almost barren, unpopulated land, the contrasting blues, reds and ochres create a dynamic light. The composition based on the Golden Mean and dynamic triangles depicts space, form and depth. Rhythmical space is created as our eyes are drawn from the top of the gorge, descending via the edges of the jagged mountainsides, down and round the route of the meandering river, through the rocky stones, to where we see the party of three men in the distance. The dynamic shadow in the foreground sweeps from left to right, from dark to light, to where the ghillies stand with their dogs. The men are talking, one is gesturing, unaware of our presence, whilst the dogs seem to know we are there. Our eyes are then guided to the mountainside above and behind the two men, into the shadow, then along crag sides towards and back to the top of the gorge and falling water. Height and space and movement are also created with the two sets of figures and the mountain peak pointing at a right angle into the sky. The figures are at the base of the triangle whilst the peak is at the top. John Henry Mole was born in Alnwick, Northumberland in 1814 to a jobbing carpet maker, whose business moved to Newcastle-on-Tyne. John’s early years were spent as a clerk in a solicitor’s office belonging to a brother of artist, William Wailes. Mole devoted his leisure time to art. During this period he joined an art society which had John Brown and Thomas Hall Tweedy as members. All wanted to develop their talents and Mole received some miniature painting tuition from Carlisle artist, Thomas Heathfield Carrick, and, at the age of twenty-one, began his professional career by painting miniatures. 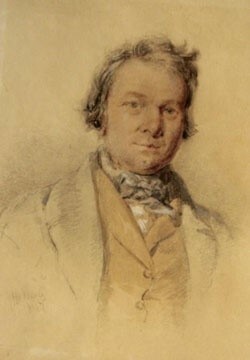 He first exhibited in London at the Royal Academy, showing four miniatures in 1845 and six in 1846. He also painted landscapes and figures in watercolours and this led, in 1847, to his election as an associate and later a full member of the New Society of Painters in Watercolours. Mole then gave up painting miniatures and moved to London, where he regularly contributed to the annual exhibitions of the New Society, afterwards the Royal Institute of Painters in Watercolours; he became its Vice President in 1884. Occasionally he painted in oils, sending a picture entitled Carrying Peat to the Royal Academy in 1879. In 1883 he was elected a member of the Royal Institute of Oil Painters. He also exhibited at the Suffolk Street Gallery, the Grosvenor and other London galleries. 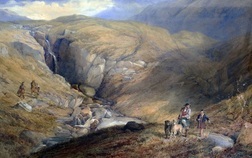 His watercolour drawings met with considerable success and three of them, Tynemouth, Coast of Devon - Gleaners Returning and Hellersdon Wood, Devonshire are in the South Kensington Museum. It is apparent from the titles of his paintings that he travelled widely and produced a prodigious body of work. 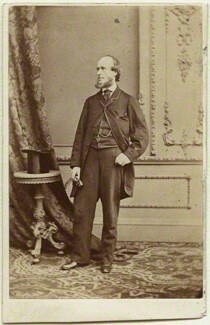 Mole died at 7 Guilford Place, Russell Square, London on 13 December 1886, aged 72, and was buried in Brompton Cemetery.